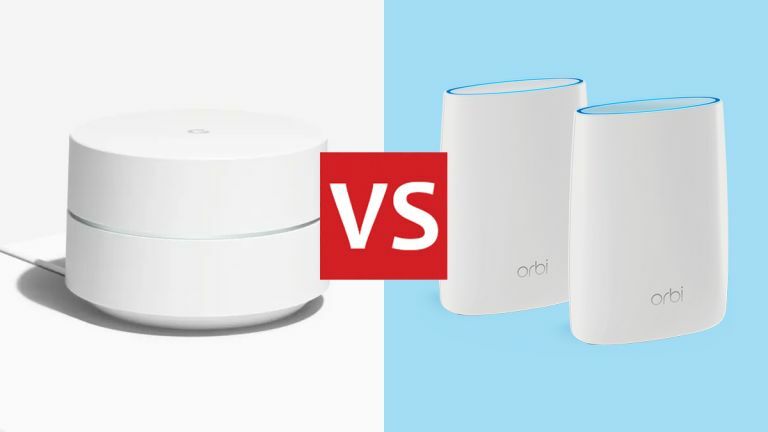 Google Wi-Fi vs Netgear Orbi: what's the best mesh network kit of 2018? If you're unfamiliar with mesh networks, they're designed to use multiple Wi-Fi points rather than a single router, enabling speedy internet access from any point in your home and fixing any dead zones in the basement or the attic. Or at least, that's the theory. There are now a growing number of affordable mesh networking kits available for the home, but here we'll focus on just two of the very best: Google Wi-Fi and Netgear Orbi. Read on to find out which one comes out on top in the battle of the smart Wi-Fi providers. To some extent, Wi-Fi mesh network beauty is in the eye of the beholder, so you can take a look at the pictures illustrating this article and make your own mind up about which batch of access points are the most attractive. We wouldn't say either of these sets of devices are ugly, but for our money, the puck-shaped approach of the Google Wi-Fi nodes have the edge over the Netgear Orbi ones – the latter are bulkier and less easy to fit in with your existing home aesthetic (they do tend to stand out). In terms of set up, it's pretty much honours even. One of the beauties of a mesh network is that everything is controlled by an app, and configuring everything is usually far easier than it is with a traditional router installed. That's true with the Google Wi-Fi and Netgear Orbi systems, with a few cable connections and a few taps on your phone all that's needed to get everything running. Both systems can be used with existing routers in place, but for an easier life – and to use all the features of your new mesh network kit – we'd advise starting again from scratch with the new gear. The main selling points of these mesh networks are to blanket your entire home in wonderful Wi-Fi, and to that end they both work very well – that's the main reason you'll see Google Wi-Fi and Netgear Orbi listed on a lot of best mesh networking kit lists. The Orbi nodes might be bulkier and more of an eyesore but they can cover more of an area and provide faster speeds to boot – 2,500 square feet (232 square metres) per unit compared with 1,500 square feet (139 square metres) for Google Wi-Fi. Factor in the relative costs and roughly speaking you can get three Google Wi-Fi devices for the same price as two Netgear Orbi devices. Most tests show Netgear Orbi outperforming Google Wi-Fi in terms of raw speed as well – the Google nodes are dual-band, AC1200 models (a maximum bandwidth of 1,200 Mbps), whereas the Orbi units are tri-band, AC2200 or AC3000 models. You won't get those speeds in the real world, and it partly depends on your internet provider anyway, but Netgear is clearly winning here. The Orbis have more Ethernet ports as well for hard-wired connections – two on the satellite nodes and four on the main router. All the nodes in a Google Wi-Fi setup are fitted with the same number of Ethernet ports – two. There's more to these mesh networking kits than raw speed of course. What we like about the Netgear Orbi range is that you've got a choice between a couple of satellite units, depending on how much speed you need and how much you want to pay. Netgear also sells Orbi plug adapters for squeezing out dead zones. To Google's credit, it's put together an app that's a lot slicker and more useful than the one offered by Netgear. You can set which nodes get priority in terms of speed, as well as controlling Philips Hue lights and anything connected to IFTTT (If This Then That) directly. As for the hardware though, it's been around since 2016, and is starting to look dated. Both the Google-Wifi and Netgear Orbi solutions allow you to set up a guest network, keeping visitors where you can see them and letting them access the web without interfering with or slowing down whatever it is you're busy doing. And while the Netgear Orbi system doesn't have anything in the way of smart home capabilities like its Google counterpart, it does have more advanced parental controls inside the app – Google Wi-Fi can do the basics of blocking adult websites and pausing the internet on any device, but Netgear is more comprehensive here. As you can see, Google Wi-Fi and Netgear Orbi do the same job but there are some crucial differences. The Netgear devices offer up better transmission speeds and can beam Wi-Fi further distances, as well as offering more Ethernet ports for your wired gadgets. Case closed? Not quite, because Google Wi-Fi comes with an app that's easier to operate and has more in the way of smart features (like disabling a particular node at a particular time). The little white pucks also look more stylish. Those benefits might be worth more to you than the very fastest speeds. For the average house (so three Google Wi-Fi units and two Netgear Orbi units) the price works out at more or less the same, though obviously both Google and Netgear occasionally offer reductions and deals. Check the widgets on this page for the latest offers from around the web. We feel confident in saying that if you want Wi-Fi all around your home and need to minimise dead zones, both Google Wi-Fi and Netgear Orbi will do a decent job. If you need more speed, think about the Netgear one first and foremost; if you'd rather something that was smarter and more stylish, the Google option might be preferable. The best barbies for your garden or patio from gas to charcoal and grills to smokers. It's the ABC of BBQ!